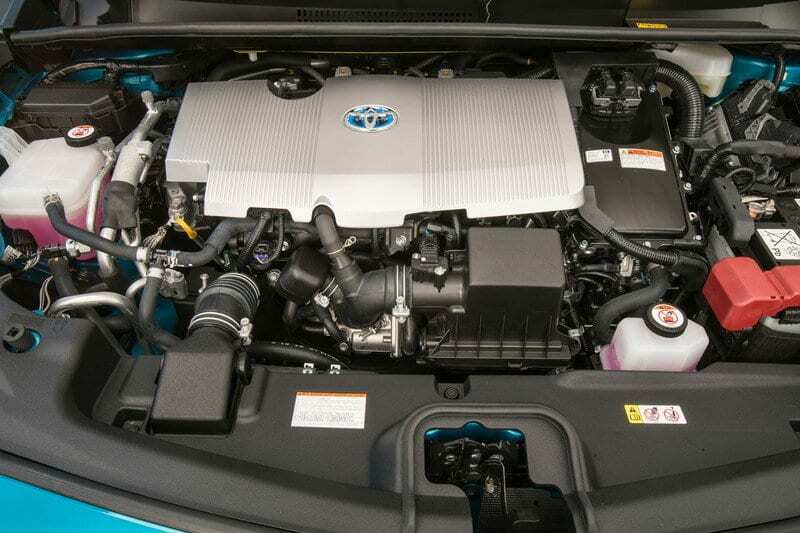 We have all been accustomed to the idea that hybrid powertrain doesn’t have to be just mpg booster. Lexus GS taught us that in its first generation with quite potent hybrid powertrain, and current things like Panamera Turbo S e-hybrid easily confirms this trend. Let’s not even go into the highest echelons with LaFerrari, McLaren P1 and Porsche 918 to admit the existence of performance hybrids and all benefits that electricity brings to the mixture. Still, some hybrids are indeed just mpg boosters. Their whole shape is governed by wind resistance reduction resulting in a visual mess, their tires avoid friction while totally neglecting grip and their engines always prefer Atkinson over Otto while their CVTs follow similar philosophy together stealing from you any hope of fun when the throttle is pressed. But what if we try to imagine that something as green and benevolent as Prius turned a bit mad. What if someday one of them falls into the hands of Toyota’s TRD division? We are here because of that, so we can imagine what 2018 Toyota Prius TRD could be. If you are wondering what’s the point, at first let us say that the Japanese company already tickled our imagination last year with Prius G concept inspired by real Prius racing car (yes! that exists for real), and that newest model learned how to corner like a proper car. At second, let us say, nevertheless, that you are probably right and there is not much point as TRD will hardly lay hands on one, ever. But what’s bad in fantasizing? You are maybe having trouble to imagine Prius looking like anything that could at least possess any sporty connotations. TopSpeed.com might as well save you some trouble, as they picked least compromised Prius of them all and garnished it with some racing flavors. 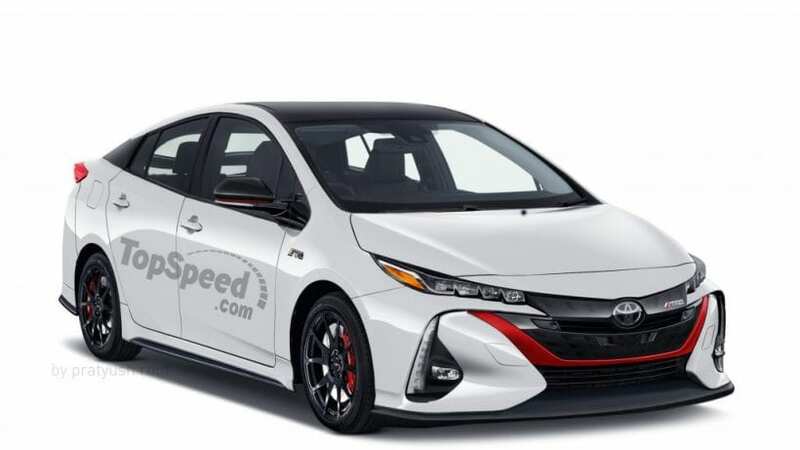 In their vision Prime version is pure white, contrasted with lots of deep black covering roof, mirrors and enlarged front lip, joined by thin spoke alloys, while fiery red calipers and accents on the grille and mirrors add final touches to the Prius’s new evil-ish side. TRD logos decorate the fenders, and low resistance tires made the space for something that can actually grip the road. As you can see, rendering in fact worked, though Prime model does come with angrier fascia from the start than the awkward looking regular hybrid. Nobody had ever tried to imagine the sporty side of its dull cabin, and we are not sure whether different steering wheel, Alcantara, carbon inserts or Recaro seats could do anything serious about it. Probably not. WHAT COULD POSSIBLY PROPEL IT? Anything but the current powertrain. 1.8-liter I4 is just shy of meek 100 hp in power delivery and electric motor boost that to unsatisfying 122 hp, taking a whole eternity to 60 mph. In this case, that eternity would be precisely 10.6 seconds. So what could possibly power hot Prius? Just don’t exclaim V8 from Lexus LC or F iterations of GS and RC. It has still to be a hybrid, doesn’t it? It’s called Prius. 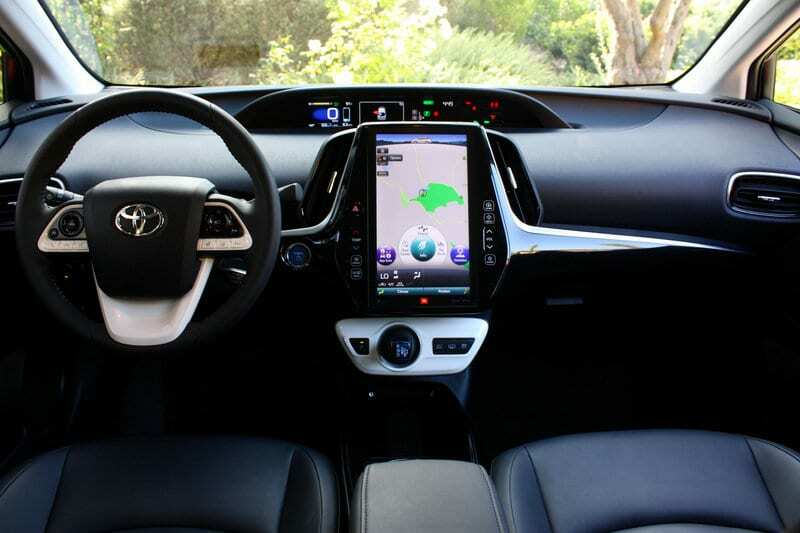 So, it can borrow 2.5-liter I4 mixed with an electric motor with a power output of over 200 hp, that we can find in Camry or regular Lexus’s sedans. That could shave some serious seconds from lousy acceleration time, and if it is coupled with retuned suspension, fiddling with CVT, maybe even with the addition of fake gears, it might as well appear in the same realm as Nissan Sentra Nismo or Hyundai Elantra Sport. But it won’t, 2018 Toyota Prius TRD is not going to happen. Still, it was fun thinking about it.